Diamond proportions are the geometry of a diamond: the angles and ratios of measurements of its cut. 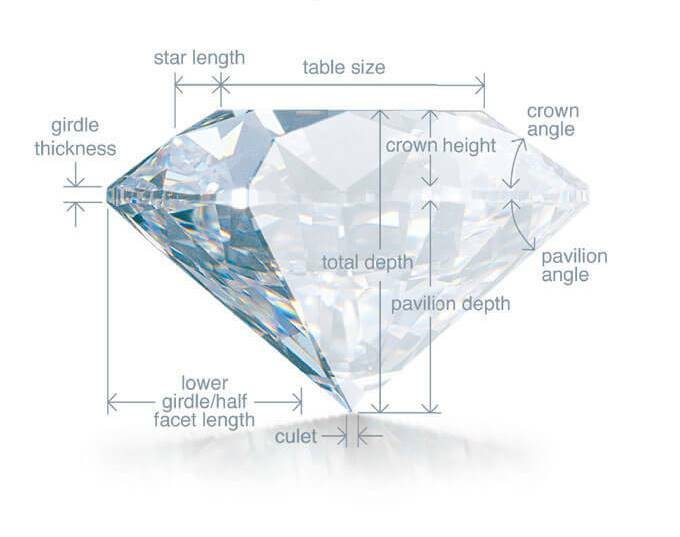 To calculate the proportions, graders use the exact dimensions of table size, pavilion depth and crown height relative to a diamond’s diameter across the girdle. The angles and relative measurements of a diamond’s facets, as well as its other proportions, have a dramatic effect on how light behaves when it enters a diamond. 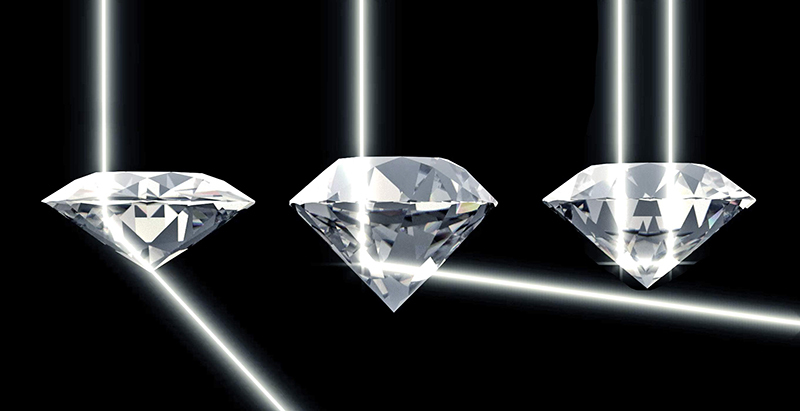 When light enters a diamond, it travels through it, reflecting off the interior of its facets. It then either leaves the diamond as white light, called brightness, or it divides into the spectral colors of the rainbow: red, orange, yellow, green, blue and violet, called fire. As you or the diamond moves, an effect called scintillation occurs – visible as alternating flashes of white and spectral-colored light and the contrast of dark and light that moves around the diamond. This dynamic contrast is sparkle. There are formulas for ideal diamond proportions: ratios and angles that result in maximum light return in a diamond. If you have a stone with ideal diamond proportions, the diamond will exhibit a lot of brilliance, fire and scintillation. This is exactly what you are looking for in a beautiful diamond. When light enters a diamond with ideal proportions, it reflects around the facets and returns to the eye. Imagine a hall of mirrors where you see yourself in every reflection because the light illuminating you reflects in every mirror in succession. But move the angle of one mirror slightly and the chain is broken unless every other mirror is moved in response. That’s why no single proportion alone can tell you about light performance in a diamond. A slight change in one and all the others must be changed in response. If the stone you are considering falls into these ranges, does that mean it has ideal diamond proportions? In a word, no. Simple charts for ideal diamond proportions like this that show ranges for each value don’t tell you anything about how an individual diamond will handle light. Not all combinations of proportions in those ranges will give you maximum light return. A tiny change in the pavilion or crown angle can make a big difference to the sparkle, fire and scintillation of a diamond. The same applies to the crucial parameters such as the table size and the depth. Symmetry and polish also affect a diamonds overall appearance. Well cut diamonds have a minimum of Very Good grades for symmetry and polish. Are there ideal GIA diamond proportions? According to a research by the Gemological Institute of America there are many combinations of diamond proportions that result in excellent light performance. GIA studied diamond cut for decades and analyzed tens of thousands of diamond proportion formulas before the system was introduced in 2005. There were more than 70,000 observations of 2,300 diamonds in studies conducted across all sectors of the jewelry industry – diamond manufacturers, dealers, retailers and potential customers. Each cut grade – excellent, very good, good, fair and poor – represents a range of proportion sets and diamond appearances. There is no single set that defines a well-cut round brilliant diamond – many different proportions can produce attractive diamonds, which should be bright, fiery, sparkling and have a pleasing overall appearance, especially when the pattern of bright and dark areas is viewed face up. Ideal GIA diamond proportions are a balancing act: each parameter changes the ideal value for other parameters. GIA diamond proportion charts allow you to estimate whether the parameters of any round brilliant diamond will result in excellent light return. A round brilliant diamond can receive one of five possible GIA cut grades: Excellent, Very Good, Good, Fair and Poor. An Excellent GIA cut grade diamond is very bright. It shows an even pattern with good contrast between light and dark areas, so the reflections appear crisp and well balanced. This tells you that the cutter created the best possible stone from the rough. A Very Good GIA cut grade diamond has bright areas evenly distributed across the stone’s crown and few distracting areas. A Good GIA cut grade diamond isn’t quite as bright – reflections aren’t as sharp and there’s more darkness or dullness in the diamond. A Poor GIA cut grade diamond has much more prominent dark areas or dullness. Given the choice, most people would pick diamonds with either Very Good or Excellent grades. The ideal diamond proportions that you prefer are also based on what you find beautiful. For example, there is always a trade-off between brilliance and fire. The more brilliance a diamond has, the less fire. Diamonds with steeper crown angles and smaller tables exhibit more fire. Diamonds with shallow crown angles and larger tables exhibit greater overall brilliance or white light return. Antique cut diamonds and some fancy cuts tend to have a lot of fire but less overall brilliance due to the larger crown angles and smaller tables. Most modern diamonds try to balance the two to give you the best combination of brilliance and fire. ROSI, our diamond-picking artificial intelligence evaluates the cut of a diamond by calculating each cut parameter in relation to all the others. A slight change in the pavilion angle requires a slight change in the crown angle to compensate. Beware of accepting retailer marketing terms that describe diamond cut as actual objective grading. There are no standards for ideal diamond proportions, ideal cuts, super-ideal, or any other cut grading terms other than those objectively applied by GIA and AGS. Be cautious when comparing cut grades from different sources, as they are most likely inconsistent. That’s why there is no substitute for examining a diamond at home and in all the lighting conditions where you will be wearing it. That is a big advantage to buying online: you can see the diamond perform in what will be its natural environment. Jewelry stores have very intense and concentrated spotlight that show off diamonds at their best. Buying online gives you the opportunity the time to view your stone in a variety of different settings, allowing you to easily differentiate between the truly well cut diamonds from the mediocre ones.